By Srinivas Chowdary Sunkara // petrobazaar // 5th April, 2019. Last night, Brent futures settled 9 cents up at $69.4 after touching $70.03, Its highest level since Nov, 12th where as the WTI prices closed 36 cents down at $62.1 a barrel. Shanghai crude oil main contract dropped by 2.3 Yuan or 0.49% to 469 Yuan/barrel while MCX crude futures closed Rs.53 up at Rs.4334 yesterday. Supply tightening and expected demand growth from recent PMI numbers continued to push bullish sentiment into oil markets. 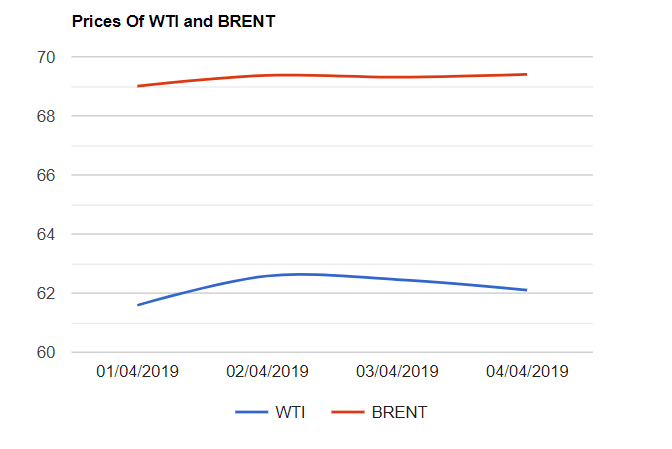 The continuous fall in U.S rig numbers for last six weeks and disruption in Venezuela's supplies are the factors extending most support to oil price rally. Today, Asian markets are trading down at the time of reporting as the traders seems to be flirted with a delay in U.S-China trade talks. weekly rig numbers are awaited today. Good day and Happy week end to all.